The Tara Semi Flush Mount will add a wow factor to your space. 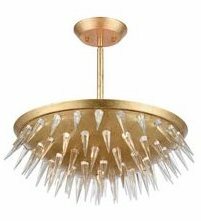 Inspired by winter flora covered in ice, the light fixture forms a breathtaking pistil-shaped silhouette bristling with sparkling crystal thorns. Made with quality crystal, beautifully faceted. Meticulously developed Gold Leaf finish. Puts heads on swivels. Features 5 E12 candelabra base bulbs.